Research shows that depth reading is important for the brain; it’s important, too, for the SAT. But practically speaking, students also have to learn how to skim, so that they have time to read everything they’re assigned in college and beyond. 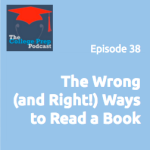 What should (and shouldn’t) students be practicing when they read to be college ready? For more information about Gretchen’s Anti-Boring Approach to Powerful studying program (which teaches these skills and more in more detail), click here. « 037: What Writing Skills are American Colleges Looking For?